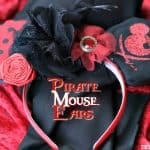 These Mickey Mouse Bath Bombs are the perfect way to relax, unwind and think about your next trip to Walt Disney World. Once the cooler fall weather starts to set in, I like to think about relaxing in a nice warm bath. I’m sorry, this girl just doesn’t do baths in the summer. Way too hot for me. 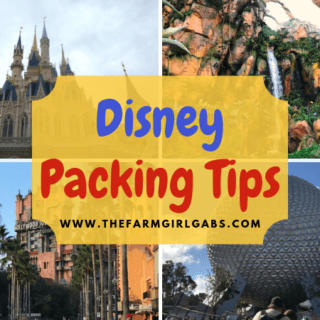 I also like to start thinking about my next trip to Walt Disney World, but that is nothing new. Bath bombs are all the rage right now. But do you realize how easy they are to make? 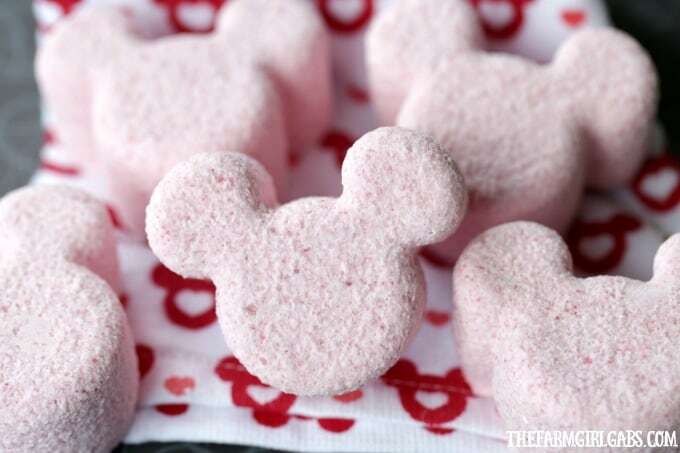 These Mickey Mouse Bath Bombs are perfect to add to your bath and relax after a long day. 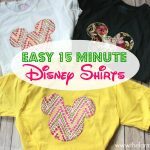 I came up with this fun idea on my last trip to Walt Disney World in May. While I was shopping at newly revamped Disney Springs, I ran into Basin, one of my favorite stores. Basin sells these adorable soaps with little Mickey’s floating inside. They also have a nice selection of bath bombs. So cute, but I really didn’t feel like carting soap or bath bombs home. That got me thinking! 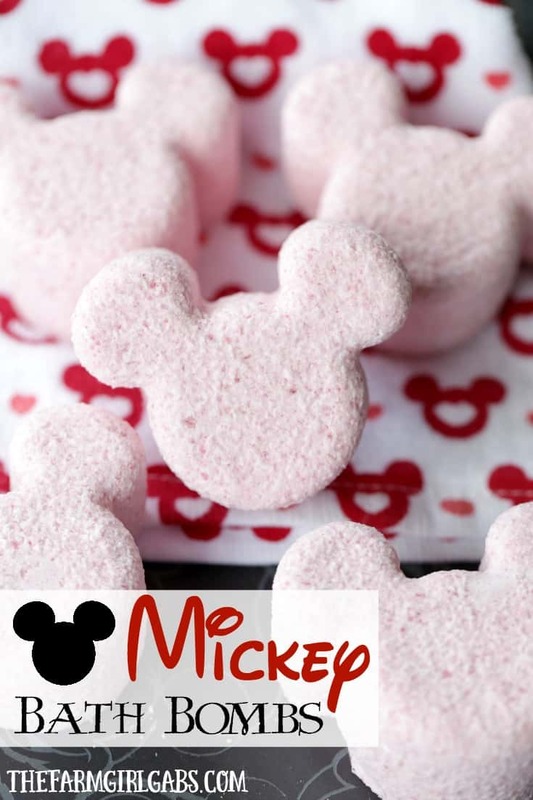 Why not use my silicone Mickey Mouse Muffin Pan and make a set of Mickey Mouse Bath Bombs. Bazinga! 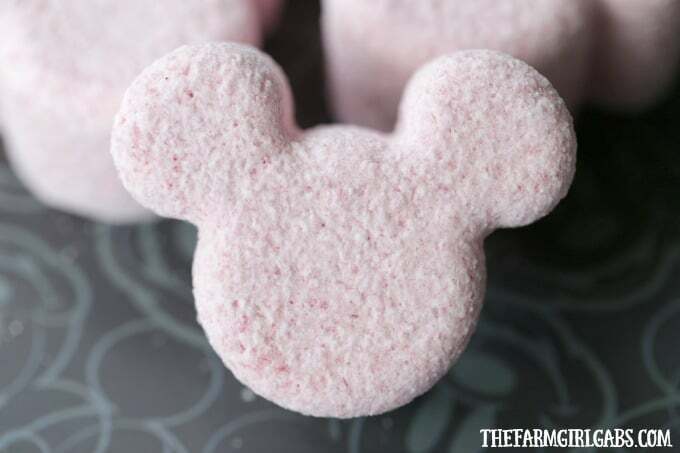 These Mickey Mouse Bath Bombs can be made with a few simple ingredients you may have in your pantry or could easily find at the store. In a medium bowl, mix all of the dry ingredients together. In a small bowl, mix the water, almond oil, essential oil and food colorant together. Slowly whisk the liquid ingredients into the dry. Firmly press the bath bomb mixture into the silicone mold. I let this dry overnight before unmolding. Bath bombs make great gifts too. 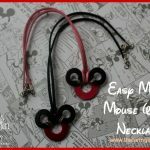 They are so inexpensive to make too. The holidays are coming quickly. Make a batch and throw together a nice DIY spa basket for your friends and family. These are the cutest things ever! I want to make these for Christmas gifts! Thanks for sharing! This is cool. What made u do this? Any suggestion when using a silicone Superman ice cube tray that is much smaller than the Mickey Mouse one? I’ve made these and they came out great my first try and the Superman shield not so great. So cool! How many does this recipe make? As well can the almond oil. be substituted for another type of oil for allergy purposes? 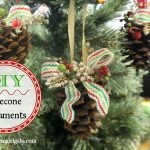 This looks wonderful DIY tutorial!